Child labor, not a new thing but surely a thing to worry about as child labor is ruining lives of many children. Child labor is simply depriving children from their studies, from their childhood life. Range of companies being indulged in child labor is much frightening. In many small towns or places, there are no better schools for children neither they have any such facility. So they believe that employment is a better option to nourish their future. It was firmly believed in European culture that if their child would follow their steps, he/she will become self-independent. Unavailability of good schools was one of the main reasons of depriving children from studies. They were followed by other reasons such as lack of modern technology etc. Being one of the top confectionery companies in the world, it has been noted for their involvement of child labor. The most disgusting thing was that the living condition of children was not so good. At least they could have paid some attention to those children who are working for them day and night. All what they need is that their work should be completed on time, no matter whatever may be the condition of the children. It is the largest chocolate maker company in US. Children are forced to do the works even if it was not of their level. They used child labor mostly in cocoa farms. They were threatened by airing off the video of the child labor, but it seemed that they were not affected by any such warnings. Another famous chocolate company which has accepted that it uses only certified cocoa. They also admitted that by 2020 they would free their company from child slavery. But this is also a fact that every year the number of children increases in cocoa farms. It is one of the leading processors of cocoa liquor. They purchase cocoa which has been harvested by child laborers. It does not have its own cocoa farm but has relationships with the buyers/sellers of such farms. In this way they can easily carry out their work with the help of children. But they have also denied the allegations of child labor which is still continuing. It has a high demand for cheap child laborers. This is the reason they cannot stop child labor in their company. Cadbury can pay more money to workers as they are encouraged by the organizations. But it seems that they are not willing to do so as workers cannot leave the company having fear of losing their job. Also, the company is also familiar with this fact. They are also involved in child labor, but the best thing which they are doing is focusing on welfare of child labor. They meet up the needs and demands of the workers so that they will work with more dedication. They focus on driving change in lives of human beings as well as the environment. They curse child slavery, but their company is also not free from child slavery. On the other hand they also work for the well being of such children who cannot go to schools due to lack of money. In an investigation it was also revealed that how companies purchase children from their parents. Many were kidnapped from their houses. Crunch is another famous company which pays less wages to their workers. The wages are so less that they cannot even afford to earn their livelihood. The living conditions of these workers are pathetic as well as very painful. These poor conditions results in spreading of diseases among people. Though it is indulged in child labor it has given a deadline to stop the involvement of children in their company. Well we can only believe, if it proves to be true. Few years before it was accused of sourcing cocoa from cocoa farms where children used to harvest cocoa. Another company which has claimed that the use of child labor in cocoa farms is our supply chain. So they cannot break their chain rather than they can focus on making lives of workers better and providing them better working conditions. Well this company has been caught in scandals many times, and they have always been involved in major humanitarian issues over many years. On the other hand they are showing their image of eco-friendly brand, but still child labor is being used in bulk. The track of this company has been marked with spots all over as they used to bring children from Philippines and assign works to them. Another fashion brand involved in child labor never stated that they do not employ young labors in their production lines. The most saddening part is that the company brings its cotton from Uzbekistan, where children are taken from schools and employed in work without giving any importance to their studies which do not get over due to such shameful activity. One of the most recognizable jean brands in the world is also involved in such scandals of child labor. Well the most embarrassing and shocking fact is that they even employ children of 8 years. Garments were made with the hands of poor women and their children. In an investigation it was found that this company compelled its workers to work 16hrs per day which is illegal all over the world. 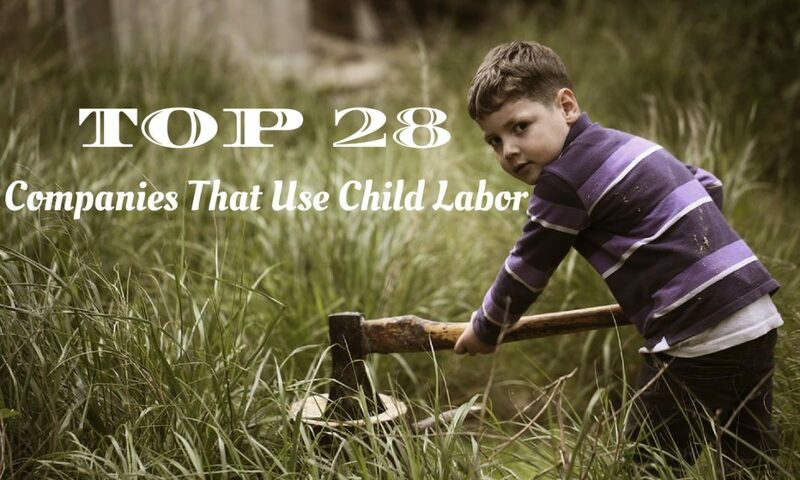 It has been practicing child labor over many years. They were not doing any legal or ethical practices at that time. All their daily works were done on an illegal basis only without putting any full stop to such activity. Even the Director of the company also said that he is not responsible for whatever illegal things are being practiced in the company. Nowadays they are violating human rights on a daily basis. Another fashion brand which forced its employees to work 12hrs a day. They were also accused of unfair trade practices in their company. It also had connections with other companies. They were also charged with 52 allegations but that showed no signs of improvement. Workers were also called from Bangalore to work in restricted area followed with few restrictive terms to work. This company has been involved in number of controversies of child labor. Yet they never disclosed about any of the supply chain of child laborers. But its true that they have involvement of children in their company as their employees. Petiton was filed against them to stop child labor. And orders were also given to lose the petition because they were not affected by it. Another leading as well as creative shoe brand was also caught in such scandals of child labor. They have also admitted that they select valuable employers from the market, but none of their activities gave a green signal to whatever they had admitted. They have been continuously involved with the tackling of child slavery in past few years. It has been praised as one of the companies who donated money in a tragedy which occured in their neighbour company. But on the other hand it also shocked us by the fact that they used to pay only 40 rupeess per day to children. Most of the Indian companies were also involved in such scandals of child slavery. Being an ultimate sensation of fashion among sports stars and young people, they are indulged in child labor. The children over here are also punished if they refused to do overtime. Even the workers are also penalised for taking leave due to any medical difficulty. So painful it sounds, but it’s the reality of this fashion brand. Yet the company has always denied over such facts. Another brand which has always been acccused of underpaying their workers as well as exploting them. Although some observers also argued of the poor conditions of the workers and their unmet demands. But the company disagreed to all such arguements as well as statements given by those observers. A Japanese company which took over the US market, has also been accused of child slavery. But then they claimed of the social responsibility after being surrounded by many petitions. They have their own cheap labors from Bangladesh who were fixed for their work without making any argument or raising any questions. Another glamorous brand who forced children to work under severe conditions by physically and mentally abusing them. Cotton used in this company were picked up by children from the cotton farms. When they were charged with the allegation of child labor, then they said that they are not aware of it as well as they are against child labor. It is one of the biggest teen retailing company involved in scandal of child labor. They have not publically stated about the child labor involvement. Rather than they have refused to support human rights violation and also are against child labor. The government of Uzbekistan is continously picking up children from school and making them work in cotton farms. La Senza is another famous Canadian company. It gives only 30minutes of break to child laborers in 10 hours of shift. The observers have also admitted that it is the worst place to work for any child. La Senza does not aim at growing its company, it is limited in growth terms. Now comes one of the most sensational brands in the world. Though they have admitted that they have the involvement of children in their company, because they needed children to perform some of their works. When they admitted this thing, some of us thought that they must be giving special attention to children as they have admitted but nothing such happened. Sounds so strange that on one side where it aims at entertaining children and making their life full of fun, on the other hand it is involved in doing child labor. The most shocking thing about Disney was that the children are made to work in substandard conditions without giving them any benefits. Young labors are very much common in such company. Another leading tobacco brand admitted that many children are working in tobacco farms. But it took only a minor part of blame on itself mentioning that it is taking steps to stop child labor in their company. After working in Tobacco Company many children suffered with the problem of nausea, vomiting, dizziness which was caused due to the release of harmful pesticides in factories. Other leading store for kids is also indulged in employment of children of 14-15years. But it has also agreed to pay fine or violation of human rights. The children were not allowed to take proper nap even at nights. Due to these illegal activities, their shares fell 6%, but no effect was seen on their work. They have been caught several times for exploitation of child labor. Well these things prove to be very shameful that such big companies are also a part of this sin. But the companies aim at maintaining the decorum of their company rather than focusing on the future of children. It’s hard to believe that these children must be having any idea of “what a childhood looks like, what is it”. They should realize that “school is the best place to work” and no other place. Next articleHow to Write an Elevator Pitch?